Igor Schwezoff was born in St Petersburg in 1904, the third of four children of a well-to-do family. His early life was, therefore, a comfortable one. But the Russian Revolution changed all that. In his autobiography, Borzoi, Schwezoff tells of the hardships he endured while living under the Communist regime until he finally defected, arriving in Harbin, China, in 1931. He had been initially smuggled over the border from Vladivostok where he was performing, and had then been detained in China in abject conditions and hidden by various supporters until he was finally free to travel to Europe. 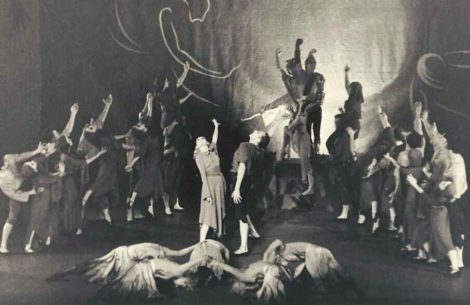 The story told in Borzoi concludes, however, in 1931 and, while Schwezoff’s early dance training and performing experience in Russia, and his burgeoning interest in choreography are covered, his Australian interlude with Colonel de Basil’s Original Ballet Russe between 1939 and 1940 is not. In Australia Schwezoff created the role of the Old General in David Lichine’s Graduation Ball, which had its world premiere in Sydney in February 1940. The Sydney press commented after opening night: ‘Schwezoff’s enormous height was a primary asset. He added to it by a cleverly ludicrous make-up and a cumbrous severity of motion.’ Archival film footage taken of performances in Australia in 1940 by an amateur film maker, ophthalmologist Dr Joseph Ringland Anderson, shows that Schwezoff at 6′ 2″ (188 cm) did indeed tower over the rest of the cast. But nothing can detract from the quality of his performance. Later, when the work opened in Melbourne, Schwezoff’s performance was described as ‘highly diverting’ and the same film footage, now fading and in disconnected fragments, indicates that Schwezoff gave a well considered performance. What stands out is his ability to take on a role and imbue it with a strong feeling for characterisation. In the case of the Old General he created an idiosyncratic character, slightly daft perhaps. But evident too is an awareness that this character was in a particular situation that required that his day-to-day military precision be tempered with gentlemanly behaviour towards the Headmistress (Boris Runanine). The tall Schwezoff, and the much shorter Runanine complement each other beautifully. What also is noticeable, especially in the mazurka Schwezoff performs with the Headmistress, is his expansive way of moving—he uses his long limbs to great advantage. 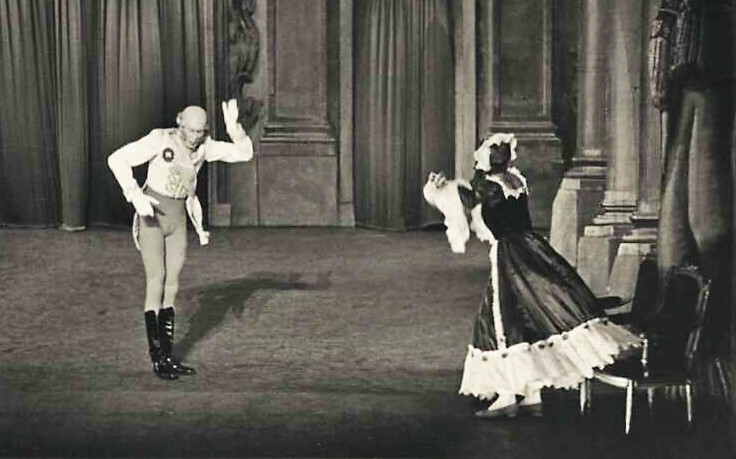 The role of the Old General became, to a large extent, his signature one and he continued to perform it into the 1940s in the Americas, including with Sergei Denham’s Ballets Russes. But Schwezoff seems not to have danced in many, if any of the other works in the standard repertoire in Australia. He is described in the biography of his Ballets Russes colleague, Tatiana Leskova, as coming to Australia as a teacher and choreographer, although this is not corroborated by others who knew him then, including Anna Volkova who maintains that to her knowledge he did not teach company class in Australia. However, Schwezoff was 36 in 1940, which was relatively old compared with the other dancers in the company, many of whom were teenagers, so it is conceivable that Schwezoff did tour to Australia largely as artistic support staff rather than primarily as a dancer. His height may well have been a further factor that determined the nature of his role with the Original Ballet Russe in Australia. The first piece of choreography Schwezoff made in Australia was probably a solo divertissement called Etude, which he performed himself to Chopin’s Etude No. 12. It was made for a midnight concert staged in Sydney on 12 March 1940 for a Polish Relief Fund and a program note states that the work expressed ‘the desperate struggle and fight of a man in his last attempt to life and freedom’, which may well have alluded to his long and arduous defection from Russia. The Polish Relief concert was mentioned the next day in The Sydney Morning Herald but without any critical discussion of the program. It was largely seen as a social event. [Schwezoff’s] individuality expressed itself in a combination of emotion with formal abstract pattern. “Eternal Struggle”—to give “Lutte Eternelle” its English title—spoke from the heart. No matter how it grouped its symbolical characters, such as Truth, Illusion, and Beauty—no matter how it drafted cohorts of people to and fro across the stage—there was always warm, human feeling within the eye-filling design. Schwezoff continued to stage Lutte eternelle in the Americas in the 1940s and, when Verchinina left the de Basil company in 1941, Anna Volkova took over her role as the Woman. The Original Ballet Russe left Sydney in September 1940 headed for the United States. Schwezoff stayed with the de Basil company until 1941. His dance life post-Australia is recorded in a variety of sources including an article in Dance Magazine in 1969, ‘Around the world with Igor Schwezoff’ and in an online article in 1979 by Scott Highton ‘Igor Schwezoff—master of the ballet’. Schwezoff died in 1982. With thanks to Pat Rader, Dance Division, New York Public Library for the Performing Arts, and Anna Volkova. Braga, Suzana. Tatiana Leskova. Uma bailarina solte no mundo (Rio de Janeiro: Lacerda Editores, 2005). Schwezoff, Igor. Borzoi (London: Hodder and Stoughton, 1935). Walker, Kathrine Sorley. De Basil’s Ballets Russes (London: Hutchinson, 1982). Russell, Nina. ‘Around the world with Igor Schwezoff’. Dance Magazine, June 1969, pp. 64-67. Stoll, Denis. ‘I present a bouquet’. Dancing Times, February 1936, pp. 635-636. Philipoff, Olga. ‘A Schwezoff ballet. A note from the de Basil company—encouraging Australian artists. Dancing Times, October 1940, pp. 8–10. ‘The Ballet. Gay world premiere. Lichine’s Graduation Ball’. The Sydney Morning Herald, 2 March 1940, p. 19. ‘Midnight ballet performance. Polish Relief Fund benefits ‘. The Sydney Morning Herald, 13 March 1940, p.5. Burdett, Basil. ‘High spirited comedy in new ballet’. The Herald (Melbourne), 9 April 1940, p. 17. ‘A new ballet. Schwezoff’s “Eternal Struggle”. The Sydney Morning Herald, 30 July 1940, p. 11. Obituary: ‘Igor Schwezoff, ballet dancer’. The New York Times, 30 October 1982, p. 35. I am a former student of Schwezzof and would love to know if you have any information as to where I could get a recording of his ballet class with pianist helio desoto. many thanks, I danced in ABT, Australian Ballet and Metropolitan Opera Ballet. I don’t know of any recordings of Schwezoff’s classes. The closet piece of footage I know of is a compilation shot by Dr Joseph Ringland Anderson showing the dancers of the Original Ballet Russe in class (probably in Melbourne). They are being taught however by Anatole Oboukhoff, although Schwezoff could well be in the class (I can’t be sure of course). This compilation is held in the National Film and Sound Archive in Canberra, catalogue record at this link. sorry I can’t be more helpful. How interesting. May I ask how you acquired it and what format(s) the material is on? Hi Craig, I am a former student and close friend of Igor Schwezoff. I am currently writing a book on my own life in dance. Mr. Schwezoff was my greatest teacher and mentor and figures prominently. I would love to see this material that you have. No matter how rough. Is there any possibility I can do so?